Its primary function is to produce the thyroid hormone, which helps regulate your body’s metabolic processes. Thyroid diseases are common culprits of excessive weight gain or weight loss and many other common complaints such as fatigue, depression, hair changes, and many more. Many women and men struggle to control their weight while unaware of their thyroid issues. 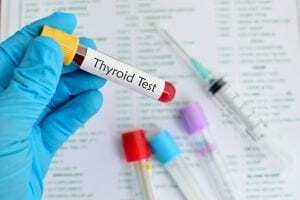 Thyroid testing is an important process in the development of a nutrition program because biology is an important a factor in weight maintenance, much like diet and exercise are. Ensuring that the thyroid is properly functioning will assist in your health care goals and management. Hyperthyroidism is commonly known as an overactive thyroid. This condition occurs when your thyroid is overproducing thyroid hormones. An abundance of thyroid hormones in your system can lead to an increased metabolism and heart rate. Increased heart rate can put you at a greater risk of having a heart attack or stroke. Hyperthyroidism can also raise your risk of developing osteoporosis (weakening of the bones), especially in women who have gone through menopause. The presence of thyroid disease increases with age. Hypothyroidism, or underactive thyroid, occurs when your thyroid doesn’t produce enough thyroid hormones. An absence of thyroid hormones in your system can lead to the slowing of your metabolism. It can also increase your levels of LDL (“bad”) cholesterol, which puts you at an increased risk of heart disease. If you are experiencing the symptoms of a thyroid disorder, it is important that you get tested. Getting treatment for a thyroid disorder can revolutionize your life. A simple blood test in the office will evaluate the levels of Free T3, Free T4, TSH, and TPO (all various forms of thyroid hormones) in your body. A diagnosis can be made based on your hormone levels. Thyroid form exists in two major forms: thyroxine (T4) and triiodothyronine (T3). T4 is an inactive form that is produced by the thyroid gland and converted to T3 in other areas of the body to its active form T3. Patients are usually treated the Levothyroxine (synthetic T4). Some studies have shown that including T3 in thyroid replacement improved cognitive function, mood, and other symptoms associated with hypothyroidism. T3 is not commonly prescribed due to some of the risks associated with its rapid release. These side effects can be limited with sustained-release T3 preparations that can be customized. Once a diagnosis is made, a nutrition plan can be tailored to fit your weight goals. In some cases, further neuro and endocrine tests will be needed to figure out the cause of your thyroid disorder. In some cases, hormone therapy can correct hyperthyroidism or hypothyroidism. In certain cases, a thyroid disorder can be a symptom of a much more serious medical condition, such as thyroid cancer. It is important to undergo additional testing to determine the cause of your thyroid disorder. If you are experiencing the symptoms of a thyroid disorder or have trouble maintaining your weight, schedule your consultation with Vitality Medical & Wellness Center today. Getting treated for a thyroid disorder can change your life. Contact our office today by calling (702) 660-4968, or fill out our online contact form for more information.